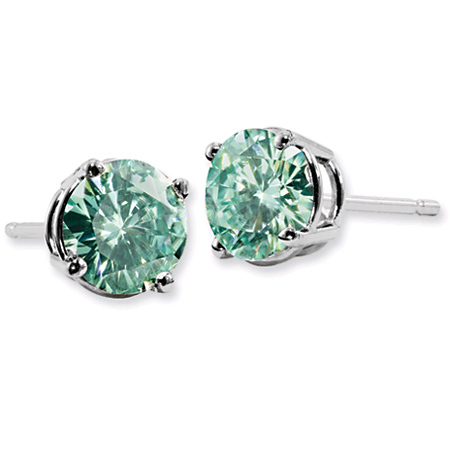 These stunningly unique 1 Carat green moissanite stud earrings from Apples of Gold offer stud earrings with refreshing softer shades of green set in a 14k white gold traditional basket setting. During creation of moissanite crystals the beautiful variations of green sometimes occurs naturally in the process. This, combined with moissanite's unique optical characteristics give these green jewels a gleaming radiance and fiery sparkle unlike any other. Moissanite measures 5.5mm round each with a total carat weight of 1 carat minimum. A patented two-step process creates jewels that dazzle from across the room even by candlelight. Each crystal is grown slowly, subjecting silicon and carbon to tremendous heat and pressure for days until a precious crystal of moissanite takes shape. Only the best are chosen to become Forever Brilliant�. We guarantee our Forever Brilliant 1 Carat Green Moissanite Stud Earrings to be high quality, authentic jewelry, as described above.